India needs over 80 lakh hotspots with a view to reach the global level of one Wi-Fi hotspot penetration for every 150 people, said a joint study carried out by ASSOCHAM and research firm Deloitte. There are currently over 31,000 public Wi-Fi hotspots installed in India. 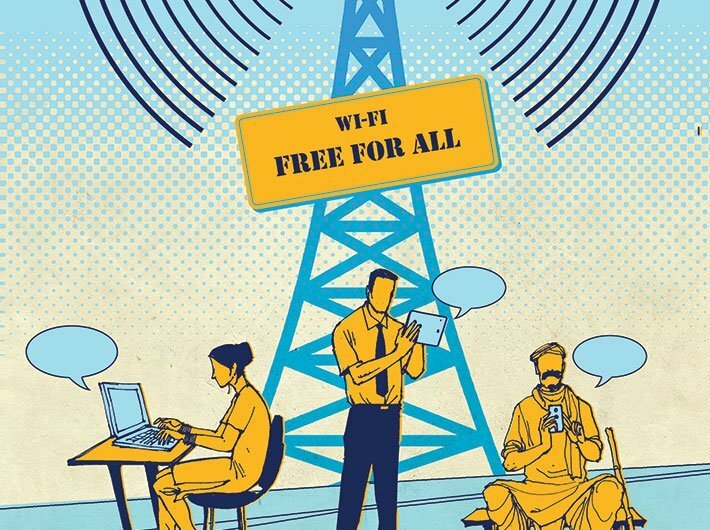 However, for India to match the current global average of one public Wi-Fi hotspot per 150 people, an additional 80 lakh hotspots need to be deployed, says the study ‘Digital India: Unlocking the Trillion Dollar opportunity. The biggest challenge faced by the Digital India programme is the slow/delayed infrastructure development. Spectrum availability in Indian metros is about a tenth of the same in cities in developed countries. This has put a major roadblock in providing high speed data services. For Digital India to have a large scale impact on citizens across the nation, the digital divide needs to be addressed through last mile connectivity in remote rural areas. Currently, over 55,000 villages remain deprived of mobile connectivity. This is largely due to the fact that providing mobile connectivity in such locations is not commercially viable for service providers, adds the joint study. “For digital technology to be accessible to every citizen significant efforts are needed to customize apps and services to cater to local needs. Finding vendors who can provide such applications has become a challenge”. Some of the common policy hurdles includes lack of clarity in FDI policies. Transport services like Uber have had frequent run-ins with the local government due to legacy policy frameworks which have not become attuned to the changing business landscape. Implementation of the Digital India program has been hampered by contracting challenges such as several projects assigned to PSUs are delayed given challenges related to skills, experience and technical capabilities. Several RFPs issued by the government are not picked up by competent private sector organizations since they are not commercially feasible. The reports suggest that, as recently as 2014, nearly 70% of Indian consumers indicated that lack of awareness was the main reason for not using internet services. Non-availability of digital services in local languages is also a major concern, noted the study. Development of digital infrastructure is a critical component of Digital India. To further enable development of digital infrastructure, the following measures should be considered as uniform policies for deploying telecom and optic fibre infrastructure. Satellite communication solutions could be used to speed up broadband access in rural and remote areas. For instance, banks can use VSAT technology to connect remote ATMs, remote branches that need instant access to customer data. It could be used as a last mile connectivity solution in rural areas which lack telecom networks. Another example could be of the navigational system NAVIC (Navigation with Indian Constellation), which can have applications in terrestrial, aerial and marine navigation, disaster management, vehicle tracking and fleet management, integration with mobile phones, precise timing, mapping and geodetic data capture, terrestrial navigation aid for hikers and travellers and visual/ voice navigation for drivers.